Further to picture #2426, here are described those remaining lots of the auction sale of Handcross Park Estate which include properties. Lot 4 comprises a cottage named as Tingley’s Cottage in the Census returns and was the home of John and Elizabeth Gates and their children, Mary and James. They lived there from at least 1851 to 1871, but Elizabeth had died in the 1860s. 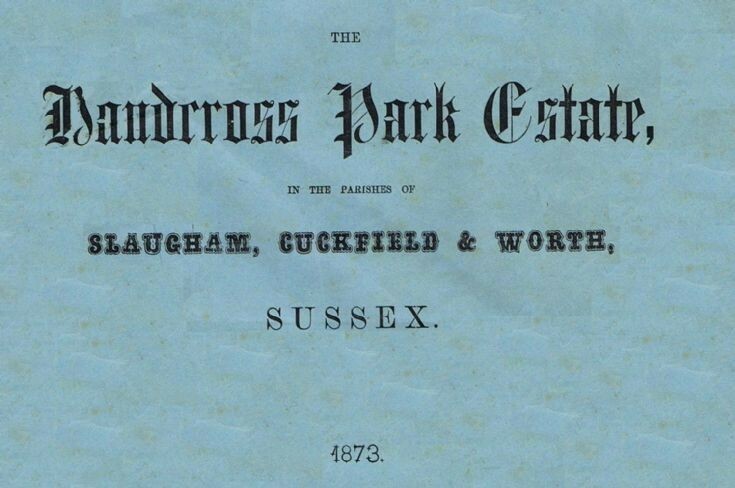 The cottage does not appear on the census of 1881 as it was pulled down to make way for the new Handcross School which opened in 1878. Unmarried Mary still lived there at the time of the auction sale and it is interesting to note that there was an annual Quit Rent of 2d, somewhat less valuable than one penny today! Lot 5 is for 1, Batchelors Buildings in the High Street of Handcross, then occupied by William and Sarah Biggs and their children, Reuben, George, Mary, Robert and Alfred. The cottage can be seen on picture #415, then the only one of the terraced row rendered. Lot 6 comprises two cottages, shop and school room and can be seen on the right on picture #92, and the rear of one of the cottages at picture #1641. The whole mini estate was named Wind Hills in the auction brochure and, after the properties were demolished, the name still lives on by the properties subsequently built. The butcher’s shop opposite the Red Lion is Windy Hills, and the neighbouring house is Wind Hill House. To view the final part of the catalogue, select Open Document.